Water contributes to the maintenance of normal physical and cognitive function and normal regulation of body temperature. At least 2L of water, from all sources, should be consumed per day as part of a healthy diet and lifestyle. Our bottle is now made with recycled plastic and still fully recyclable, so pop the cap back on and it can be put in your recycling bin and made into something new again. Produced in our zero waste certified factory, sustainability is at the heart of everything we do. 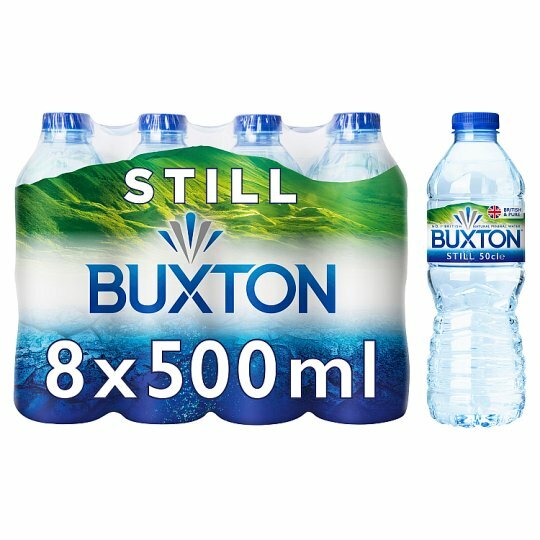 Buxton Natural Mineral Water is utterly pure, and a great way to hydrate naturally. The handy 50cl bottle is the perfect size to take with you on your busy day; to work, for lunch, or at the gym. Store in a cool, dry, clean place away from light, strong odours or chemicals., Consume within 3 days of opening., Best Before end: see bottle.